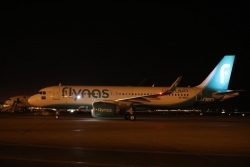 50% of flynas fleet will be upgraded by 2021. Four Airbus A320neo will be received before the End of 2019. Riyadh, Saudi Arabia, March 17, 2019 --(PR.com)-- flynas, the national Saudi air carrier and leading low-cost airline in the Middle East, has received its second Airbus A320neo aircraft on Tuesday, March 12th from the 80 new planes purchased through an $8.5 billion deal with Airbus. This deal is the second-largest aircraft purchase deal in the Middle East and is a game changer for the air-travel industry in the Kingdom and the entire region. It also marks a strategic milestone for flynas, which is set to receive four more aircraft before the end of 2019. Mr. Bander Al-Mohanna, flynas’ Chief Executive Officer, said the deal would allow flynas to travel for longer distances and reach new destinations with the aim to cater to a wider range of travelers. flynas will run flights to new summer destinations in June 2019, with direct flights to Batumi and Tbilisi in Georgia, Vienna in Austria, Baku in Azerbaijan, Trabzon in Turkey, and Sarajevo in Bosnia and Herzegovina. flynas’ CEO added that by 2021, Airbus A320neo aircraft will make up half of flynas’ fleet, which supports Vision 2030’s targets to develop the civil aviation sector. He added that upgrading the fleet will also support flynas’ expansion strategy which aims to widen its scope of business and increase its share within local and international aviation markets. Al-Mohanna also emphasized that the first Airbus A320neo, which was received in November 2018, was applauded by passengers due to its roominess. He said that new features will be added to provide more luxurious flights for passengers. Airbus’ A320neo is known to boost the most spacious cabin among single-aisle aircraft. Moreover, the aircraft is fuel-efficient which makes it eco-friendly.